In the peaceful kingdom of Angel Land, the light goddess Palutena grew angry with how the goddess of darkness Medusa treated mankind. After being banished to the Underworld. Medusa joined forces with the monsters and waged war against Palutena's Sky Palace. Using the last of her magic, Palutena contacted the head of her guards, the valiant angel warrior Pit. 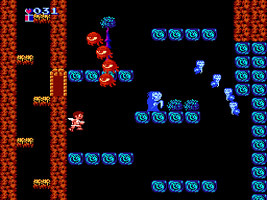 Armed with a bow and arrow, Pit must travel through the Underworld, Overworld and Sky World and retrieve three Sacred Treasures from the dungeons there if he is to defeat Medusa. Train with Zeus, complete the challenges and buy more powerful weapons, then free Palutena's Soldiers from Medusa's spell to help you take out the boss characters. Find out more about the characters, enemies and items you will face on your adventure through Angel Land. Find out more about the hidden secrets found in Kid Icarus.